Perhaps the reason why self-serve ice cream parlors that feature extensive topping bars are becoming so popular throughout the world is the control that is given to the customer. Many customers love the chance to create their own ice cream flavors and ice cream dishes. A self-serve ice cream parlor gives customers the chance to try out their own culinary and creative skills and see if they can come up with something amazing. Customers also love topping bars because they offer them hundreds of options for customizing their ice cream depending on their current mood and cravings. Some days, a customer may want an ice cream dessert that is loaded with candy of all shapes and sizes. Other days, a customer may want something more traditional such as classic fruit toppings or sprinkles. The ability to choose whatever tickles their fancy in the current moment offers great freedom and satisfaction to customers. If you plan on creating an ice cream parlor with an extensive and customer-satisfying toppings bar, you'll need to choose toppings from all of the following categories. You will also need a supply of durable, acrylic topping dispensers to keep your toppings fresh and great tasting all day long. Ice cream sauces are irreplaceable on a topping bar. When a sauce is added to an ice cream dessert, it is unifies the toppings with the ice cream. With sauces, customers can be sure that each bite of their freezing cold dessert will be filled with delicious toppings that won't fall off the spoon. Toppings that are must-haves include hot fudge and caramel syrup. You can also add other syrup flavors, however, such as white chocolate, butterscotch, and berry-flavored syrups. Make sure to store your warm sauces in sauce warmer merchandisers, that are easily accessble to your customers. Many customers love putting candy on their ice cream, so it's important to have a wide selection of different candies and chocolates available. Candy-coated chocolates in bright colors are very appealing to customers. For customers that cannot resist the combination of chocolate and peanut butter, you might consider offering chopped chocolate-covered peanut butter cups. Toffee, caramel, cookie crumbles, chocolate chips, white chocolate chips, gummy bears, fruity candies, and candied sprinkles are also popular topping choices. 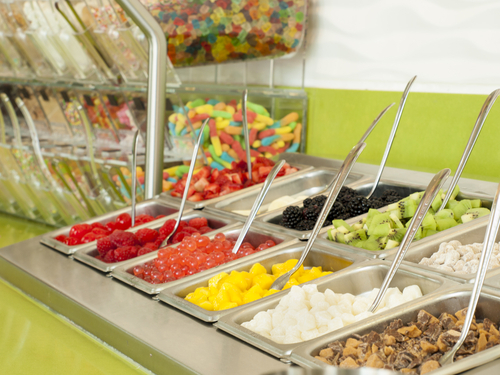 As more and more consumers start to think about health even when choosing a dessert, it becomes increasingly important to offer a wide selection of fruit toppings at an ice cream toppings bar. Strawberries, raspberries, blueberries, banana, orange pieces, and pineapple are all popular choices for ice cream toppings. Many customers like a little crunch in their smooth, sweet dessert. This can be achieved by offering popular cereal flavors as toppings in your topping bar. Choose a variety of flavors and textures to satisfy a variety of customer preferences, such as granola, sugar coated corn flakes, rice crispies and fruity cereals, to name a few. You cannot have a complete toppings bar without including a variety of nuts. Pecans, peanuts, cashews, and walnuts are the most popular ice cream toppings, but you can include other nut varieties as well. Including a wide variety of different toppings at your ice cream parlor will ensure that everyone can find something that they love. Customers enjoy the freedom to create all types of ice cream extravaganzas offered by these types of ice cream parlors, and owners enjoy the satisfaction and profits that come from happy, repeat customers.